In a shallow roasting pan, spread a thin layer of chili on the bottom. Layer tortilla on top, spread chili, sprinkle with cheese, dash with jalapeños and continue to layer until you’ve reached the top of the pan. Make sure the last layer is cheese. Place pan in oven and cook for 1 hour at 325 degrees. When serving, flip the pan over, and slice into squares. Top with salsa, sour cream, pickled jalapeños, and cilantro. Now, why use chili instead of a meat sauce like lasagna usually uses? Mostly because chili is usually spicier, and has a nicer consistency than normal lasagna sauce has. 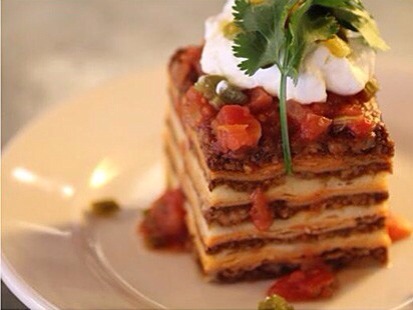 Since your not using lasagna pasta, you want something to match the nachos better and chili does that nicely.